Hey guys, sorry it’s been a month since I’ve posted anything over here, but it’s been super crazy! The Ouya portable has officially become my second biggest success, and my largest video on You Tube. Second of course to The Cross Plane, which though the video on my YT only shows about 6K views, the Kickstarter page is over 60K and on Jon’s YT, is almost 10K. But anyway, that’s not what it’s about, it’s just fun to measure it up to other accomplishments! Speaking of accomplishments, on Sunday June 1st, I had and interview done on me via Skype by a moderator known as [KillSwitch] over on the OUYA Forums. They are one of the coolest forums I’ve been a part of, much because of their open and constructive attitudes. Not to mention, they go right to the top with the OUYA Brass which helped push this project into the lime light. Over the next few days I’ll be making a few small updates to the site and adding some of the press coverage to the “Projects That Made Waves” page and can read what others around the net had to say about it. The Interview can been seen below. Note that my Internet connection crapped out in spots and it becomes unwatchable for a minute around the 31 min mark, should anyone actually get that far into the video. hehe. It was a lot of fun to do though as I’ve never had an interview done before, so it was a cool experience. Also, here is a partial copy of the email that started this whole thing. Word got to OUYA corporate about my project and they put it in their weekly newsletter! I thought that was really cool! Partial copy of the Weekly Newsletter sent out a couple weeks ago. But alas, this ends on a somber note. 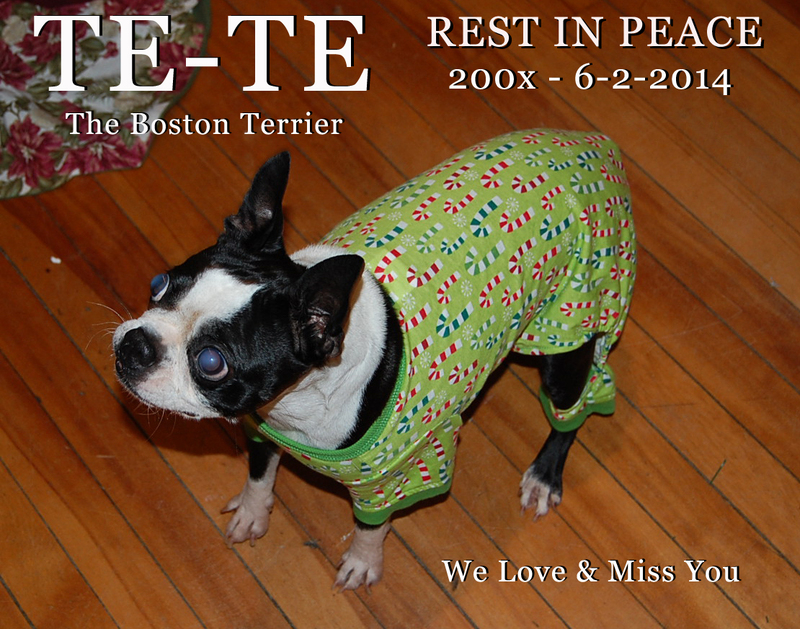 On June 2nd, my wife and I lost our beloved Boston Terrier Te-Te. She had to have been in her early teens, we rescued her from a puppy mill about 6 years ago and was one of the hardest goodbyes I ever had to do. It was the right thing to do though, but it’s never easy.